A hundred ways of looking at Che Guevara. On October 9, 1967, a Bolivian army communiqué from La Paz announced that Ernesto “Che” Guevara, the Argentine-born Cuban revolutionary comandante turned itinerant guerrilla, had been hunted down by soldiers and killed in battle. The New York Times responded editorially, and with evident satisfaction, that if the report proved true, “as now seems probable,” then “a myth as well as a man has been laid to rest.” It was not the Times‘s most accurate prediction. Photographs of Che’s lifeless body soon appeared in newspapers around the globe, putting to rest doubts about his death. Perhaps the most famous image was one taken by Freddy Alborta, showing Che’s corpse being displayed to the press by Bolivian army officers. Yet controversy over the circumstances of Che’s death continued to brew. Was he killed in combat, or in cold-blooded execution? The latter. Did the soldiers who killed him amputate and preserve his hands and then cremate the body? His amputated hands were smuggled to Cuba in 1970, and his bones were discovered by a Cuban forensic team in Bolivia in 1997 and returned to Cuba for state burial. In Che’s Afterlife: The Legacy of an Image, Michael Casey reports that local peasant women who paraded by Che’s corpse on October 9 with the permission of triumphant Bolivian officers “surreptitiously clipped locks of hair from Che’s head, saving themselves a future talisman.” A few weeks later, the journalist and novelist Jose Yglesias, reporting on Che’s death for The Nation, indulged his readers with a different sort of memorabilia. Yglesias wrote that like the relics of St. Teresa of Avila, a sixteenth-century Carmelite nun and mystic, Che’s hands “may well be with us for a long time to strengthen the nonreligious but barefoot Order–like Saint Teresa’s stoical Carmelites–of the guerrillas of South America.” The mythic appeal of the slain revolutionary, known to many today in Latin America as “San Ernesto,” has only grown in subsequent years. “Unwittingly, the Bolivian military delivered the world a lasting and sympathetic picture of the man they’d hunted down,” Casey writes. “They gave it a crucified Che.” Indeed, John Berger and other art critics have argued that Freddy Alborta’s photo of Che’s corpse bears a startling resemblance to Renaissance depictions of Jesus Christ at the moment he was brought down from the cross by the Romans. Che hardly ever sat for a bad photo–even in death. But of all surviving photographs of him, one in particular stands out: the head-and-shoulders portrait of a bearded, longhaired, 31-year-old Che, wearing a bomber jacket and his trademark beret emblazoned with the comandante star. Casey makes this image the central concern of Che’s Afterlife, and in the book’s opening chapter he offers a vivid re-creation of the “frozen millisecond” when the photo was taken. The date was March 5, 1960; the location a spot near Havana’s Colón cemetery; the occasion a public funeral sponsored by the revolutionary government. The previous day a French munitions ship delivering arms to Cuba had mysteriously blown up in Havana harbor, killing scores of people and wounding hundreds. CIA involvement was suspected but never proven. Che, who had been at a meeting nearby in downtown Havana when the ship exploded, rushed to the docks and helped provide medical aid to the wounded and the dying. Korda knew he had taken a good picture, but his editors failed to agree: the photograph did not run in the following day’s Revolucíon. Over the next few years it would enjoy only a few low-key appearances in Cuban periodicals. Eventually, someone in a position of influence recognized the image’s iconic possibilities. Shortly before Che’s death, the photo–by then known as “Guerrillero Heroico”–was made a centerpiece of official Cuban propaganda. It adorned the hall at an international gathering of artists and writers in Havana in May 1967 and later that summer was displayed at the founding meeting of the Organization of Latin American Solidarity (OLAS). Korda’s “Guerrillero Heroico” became routinely coupled with Che’s famous slogan calling on the international left to “create two, three…many Vietnams.” In the aftermath of Che’s death, the Korda photo, or various graphic derivations, became a staple of radical newspapers and left-wing poster art in North and South America and Western Europe. And in an ironic post-1960s development, the image took on yet another life–this time as a marketing device, used to sell everything from air fresheners to condoms to an ice cream bar called Cherry Guevara. Unfortunately, that promise would go unrealized as Communist Cuba hardened in the shadow of its Soviet big brother. In the early days of the new regime–and in a moment most at odds with the Guerrillero Heroico legend–Che did a stint as a prison commander at La Cabaña fort in Havana, where a number of political prisoners were executed. (Estimates of the victims range widely, from a few hundred to many thousands.) Many of Revolución‘s editors and writers would themselves become exiles before the decade was over. As for Korda, he remained a revolutionary true believer throughout the difficult years that followed. He also became a savvy enough legal tactician to succeed in reclaiming the property rights of his famous photo and some of the profits generated by its unexpected commercial success in the late twentieth century. In a September 2000 legal settlement, an ad agency in Britain agreed to pay $75,000 for unauthorized use of “Guerrillero Heroico” in a Smirnoff vodka advertisement, and Korda donated the money to the Cuban healthcare system. The court’s decision removed the photo from the public domain, establishing the aging photographer as the clear copyright owner. Korda died the next year, leaving various Cuban heirs to squabble over the newly valuable estate. There, in the Plaza de la Revolución, the Cuban revolution’s world headquarters, its leader converted the hitherto little-known Korda image into a powerful mnemonic, a lasting logo. Castro combined the Cuban revolution, Che’s stellar qualities, and the Guerrillero Heroico image into a single attractive product…. Just as urban sneaker-wearing teenagers seem susceptible these days to advertisers who encourage them to identify with brands such as Nike or Tommy Hilfiger, in late 1967 radicalized students across the Western world were ripe for the Che brand. The flaw of Casey’s approach is not its irreverence or its cynicism–both of which might seem to be merited by the less than inspiring outcome of the Cuban Communist experiment–but rather its ahistoricism. Che was not, in fact, an unknown “brand” in student circles in the Western world that burst upon the scene in October 1967 like a hot new rock group (or a snazzy and well-promoted pair of sneakers). There is no indication in Che’s Afterlife that Casey has read Where the Boys Are: Cuba, Cold War America and the Making of a New Left (1993), in which historian Van Gosse argues for the inspirational role of the Cuban Revolution for at least some American New Leftists at the very start of the 1960s. Casey does not mention either C. Wright Mills’s influential and bestselling polemic Listen, Yankee: The Revolution in Cuba (1960), widely read in student circles in those years, or Malcolm X’s praise of Che as “one of the most revolutionary men in this country right now,” when the Cuban leader visited New York City in 1964 and denounced racism in South Africa and the American South in an address to the United Nations. Casey’s determination to pinpoint the moment of the “brand launch” of “Guerrillero Heroico” is simply irrelevant to the actual political history of the 1960s. Even though the image had gone unpublished outside obscure Cuban newspapers, the mainstream American media, as well as the radical press, had kept Che’s name and face in the public eye for years: from his days as Castro’s sidekick, to his disappearance from view in Cuba in 1965, to his life as an international man of mystery until October 9, 1967. The New York Times Magazine, for instance, ran a four-page feature story in 1966 with the headline ¿Dónde Está? Whatever Became of Che? Although critical of Che’s politics, the article–unmentioned in Casey’s account–quoted a recent graduate of Santo Domingo University in the Dominican Republic who called the vanished revolutionary “the purest of the pure,” someone who “hasn’t been corrupted by power.” The Dominican student concluded, “I bet right now he is fighting the oligarchs and the yanquis not far from our country.” The subsequent launch of the Che brand is already encapsulated in those words, which have nothing whatsoever to do with the marketing instincts of the Castro regime. Casey also lacks a basic understanding of the chronology of the era. “Especially after the death of Martin Luther King on April 4, 1968,” he writes, “civil rights leaders such as Stokely Carmichael, Eldrige [sic] Cleaver, and Malcolm X became vocal advocates of a more militant struggle for black Americans.” Malcolm, of course, had been assassinated more than three years before King (and shortly after praising Che), while Carmichael and Cleaver had been vocal advocates of “militant struggle” for quite some time before April 1968. For the sake of his pet marketing analysis, Casey seems to want to infantilize and trivialize all ’60s radicals, depicting them as just so many naïve groupies bowled over by the Guerrillero Heroico consumer style: “Guevara the warrior fit the hippie stereotype of beauty–strong and handsome, but sensitive and loving at the same time.” No doubt there were youthful communards who pinned silk-screened posters of Che on the wall next to one of Jimi Hendrix and couldn’t quite tell the two apart after a few tokes of Panama Red. But is that really the appeal and meaning Che held for Carmichael or Hayden–neither one a hippie softie–or their numerous followers? Casey can’t answer the question, because his study lacks a comparative dimension. 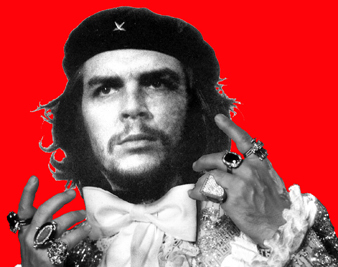 Che’s image was not uniquely popular among Western radicals in the 1960s–it was not the undisputed “defining icon” of the era, as Casey would have it. There was the famous photo of Malcolm X in full rhetorical flight, finger pointing in accusation. There was Huey Newton sitting in a wicker chair, with a rifle in one hand and an African spear in the other. There were anonymous Vietcong soldiers, men and women, clutching AK-47s, the Guerrilleros Heroicos of another struggle, their images a regular feature in the pages of New Left Notes and similar publications. There were even enough posters of Chairman Mao to provoke the Beatles to sing in 1968, “If you go carrying pictures of Chairman Mao/You ain’t going to make it with anyone, anyhow.” Could John Lennon not think of anything to rhyme with “Che”?